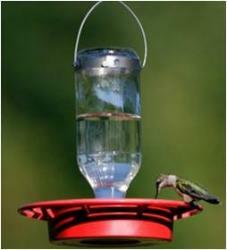 Glass feeder bottle holds 30 oz of nectar, with a no drip base; 6 feeding stations with removable flowers for cleaning; full-circle perch to gather more hummers. 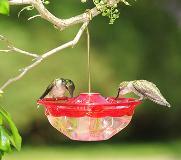 The Best 1 Hummingbird Feeder has a two piece drip-resistant base and is easy to clean. It attaches to a 32 oz. glass bottle for our friends with a lot of Hummingbirds. The "New Hummer Hat" will attract more hummingbirds, keep the nectar cooler, proctect the nectar from becoming saturated by the rain and can stop squirrels from getting the nectar. 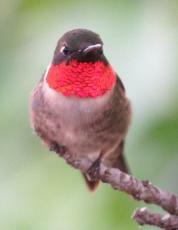 The hummingbirds will spend more time at the feeder during and after rain storms when the flowers are closed. This colorful combo supplies nice, cool nectar for your hummingbirds. It is as attractive to you as it is irresistible to them! 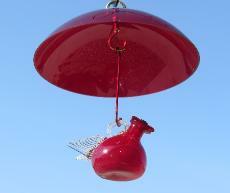 The bright red tinted baffle helps to protect the nectar from the hot sun, while attracting more hummingbirds. 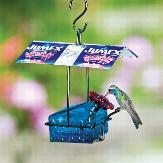 A great place for your hummingbirds to hang-out during an afternoon thunder shower! Stop ants and attract Hummingbids with our "Bright Red" ant moat. Also available in "Bright Orange" to help attract Orioles. Remember to add water to the inside of the cup to stop the ants. Small birds will also use the cup as their own private bird bath. water. Call or email us for more details! The name "Jewel Box" tells it all. Once you attach this beautiful little hummingbird feeder to your window you will have flying jewels (Hummingbirds) for you to enjoy. The built in ant moat allows you to enjoy your hummingbirds without having to be bothered by ants. Features: High View perch that makes viewing easier and also encourages longer visits to the feeder, a rounded bottom that allows the Hummingbirds to get every last drop of nectar, built in ant-moat that blocks crawling insects,and 4 raised feed ports to divert rain! Large 12 oz capacity. Will accept Nectar Guard tips to stop wasp and bees. EASY to Clean, and DO NOT Drip! (holds 3 ounces) with attractive Copper hanger. 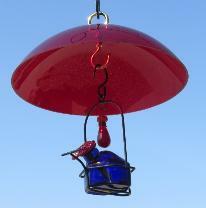 Purchase the Feeder and the Red Dome Cover as a COMBO and SAVE! separately or SAVE and purchase them as a set below. SAVE when you purchase the feeder with the Dome cover. Choose color of feeder (Shown in Blue). Dome will be Red. See your hummers UP-CLOSE! Three ounce feeder suction cups to Window. Easy to clean and Fill basin removes from holder for filling without having to detach suction cups from window! Sports an attractive copper holder for nectar basin. Same great Easy-to-clean and fill features as the popular 12 ounce model. Raised perch encourages hummers to visit longer. Has a built in ant moat plus accepts Nectar Guard Tips to exclude bees and wasps! 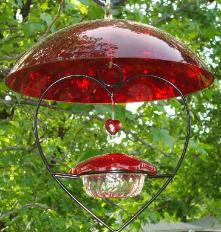 Terrific USA-made Hummingbird feeder! Easy to clean and fill, has 3 nectar ports (which will accept Nectar Guard Tips to exclude wasps and bees). 4 ounce capacity. Made by Aspects and carries their Lifetime Warranty.